Hello everyone: The new theme over at the SHOPPING OUR STASH challenge blog is "BUGS, BUGS, BUGS", any kind of bug will do. Here is my card and I hope it inspire you to play along. 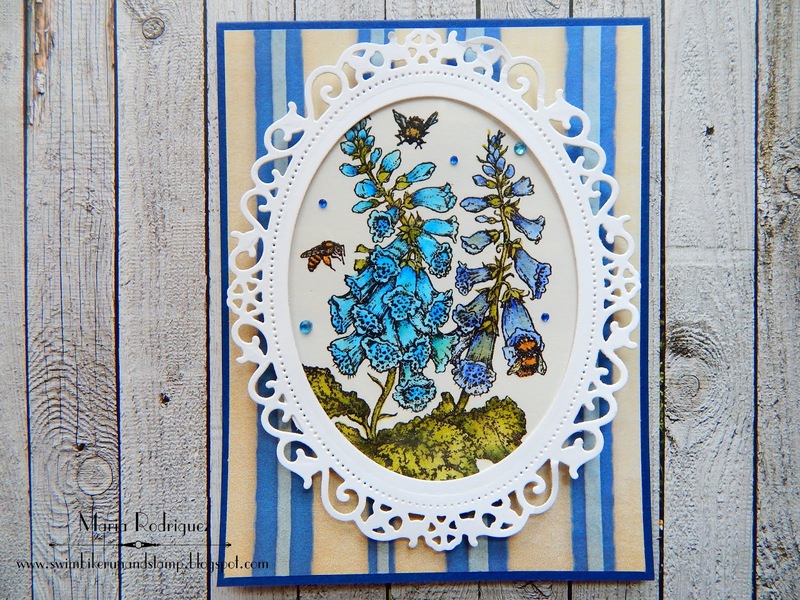 This image is from my Power Poppy stash of stamp sets and it's called "Dynamic Duos: Foxglove and Ranunculus, it was released as a stamp set back in June of 2016. I pounced on it immediately. I stamped the image on a die cut piece of watercolor paper with Stazon black ink, colored it with Sakura Koi watercolors an added a few Rhine Stones. I then die cut a piece of white card stock with the Spellbinders die set called Floral Ovals to frame the pretty flowers. I just love the little bees around the blooms. The pattern paper was given to me by my granddaughter Vanessa a couple of years ago. The image and sentiment are from the same Power Poppy set. I lightly colored the image with Prismacolor pencils. So I hope you stop by the SHOPPING OUR STASH blog and check out the rest of the teams' projects and then come and join us in the gallery. Hello everyone: I have 5 little boxes to share with you that I've created for the new "Anything Goes" RETRO RUBBER challenge. They are CASE'd from the wonderfully creative Julie DiMatteo who as a blog called The Paper Pixie where you'll find her amazing video tutorials to create some of the prettiest little boxes for party favors or any other celebrations. Her videos are so fabulously detailed but totally easy to follow, she is a delight to listen and watch. These little boxes I'm sharing were made following her directions and I will link each one to the actual video so you can check them out. And here they are individually, with the link to that particular video tutorial and a description of what I used to create them. I used some pattern paper from Lili of the Valley (discontinued) and card stock from my stash. The sentiment is from the SU set called "Bella and Friends" from the 2016-2017 catalog. 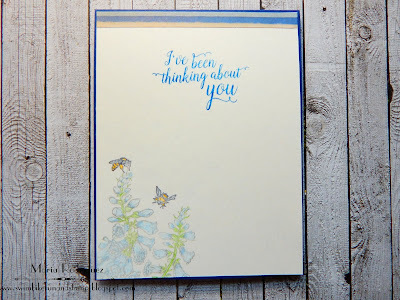 This box was created using Real Red card stock, the sentiment is from the SU set called "Best Birds" from the 2016-2017 catalog. The Pattern Paper for this box is from My Paper Studio, the sentiment is from a SU set called "Whimsical Words" from the 2010 Sale-a-bration catalog. The pattern paper is from my stash, the sentiment is from the SU set called "Touch of Kindness" from the 2011 Summer Mini. Pattern paper from My Paper Studio, sentiment is from the SU set called "Kindness Matters" from the 2011-2012 Idea Book and Catalog. 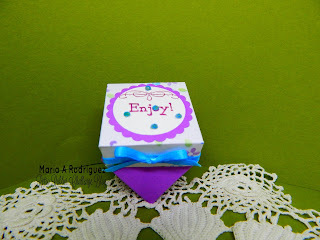 So there you have them, this adorable treat boxes can be done in any color and for any occasion, they are loads of fun to create and will delight and amaze the recipients. 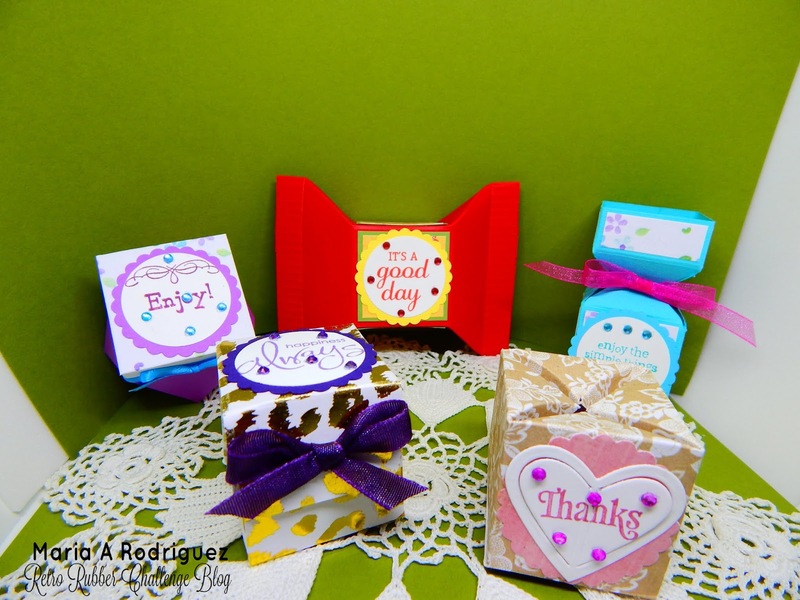 Thanks again to Julie DiMatteo from The Paper Pixie for inspiring me to create this awesome little boxes, I hope you give them a try. I hope you get inspired to come and join my teammates and me over at the RETRO RUBBER challenge blog and check out what the rest of the Designer Team created. Please remember that the stamps you use MUST BE OVER A YEAR OLD, if you have the date of their release or the date when you purchased them, we surely appreciate you sharing that with us. Cute and Crafty Challenge #8 "Anything Goes"
Pammie's Inky Pinkies Challenge #1834 "Anything Goes"
Woopsi Daisy Challenge "Anything Goes"
613 Avenue Create Challenge 212 "Anything Goes" Optional "Magic or Fantasy"
Angie's Digital Stamps Challenge #23 "Anything but a Card"